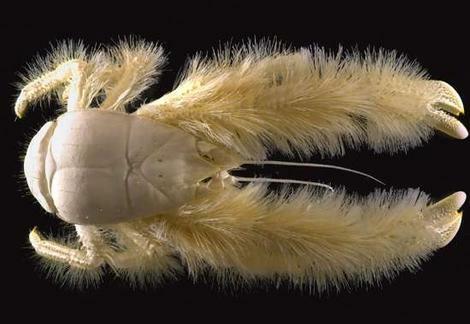 The image to the left (assuming that the hosting site hasn’t yanked it by now) is of a new species of “hairy lobster” discovered in the French Pacific. Cool. Sort of. Details here. So it seems Iran is responding (predictably, mind you) with belligerence in the face of the US-led belligerent threat to Iranian sovereign rights. Yes, I’m talking about Iran’s nuclear programme. The Persians now say that the Americans’ threat to deny Iran a nuclear programme will result in the US being denied Iranian oil. Well, here comes the obligatory military solution. Meanwhile, the US has tacitly approved both India’s and Pakistan’s nuclear programmes and has long turned a blind eye to Israel’s well-known nukes. And Russia continues to negotiate with Iran for some sort of processing partnership which, on its face, looks like a compromise which will allow Iran domestic atomic power production while denying it nuclear arms production, but which might also be a localized arms proliferation agreement. The long and short of all this is that the Nuclear non-Proliferation Treaty is effectively dead. The IAEA has been compromised, with its director calling India “an important partner in the non-proliferation regime”, since India and the US signed a civilian nuclear partnership deal, even though neither India, Israel nor Pakistan are signatories of the NPT! Guess who is? Iran. A weird, weird little atomic play, my friends, and possibly the most important events currently being played on the geopolitical theatre. Meanwhile –surprise, surprise– a paper has dared to published disrespectful cartoons of Jesus, and has paid a price! It was a student paper, and the editor was compelled to resign. So why haven’t those Danish, German and French papers rushed to reprint these cartoons, since they are, after all, the great defenders of cartoon free speech? I’m waiting. writing are largely the defense of the indefensible."